Welcome to my website! Here, you will find relevant information about my research, teaching, book writing and other activities. As you will see by browsing through this website’s pages, I am particularly interested in the modeling and management of risks in finance and insurance. You want to follow my recent activities? Subscribe to my monthly newsletter. The calculation of Net Asset Values and Solvency Capital Requirements in a Solvency 2 context – and the derivation of sensitivity analyses with respect to the main financial and actuarial risk drivers – is a complex procedure at the level of a real company, where it is illusory to be able to rely on closed-form formulas. The most general approach to perform- ing these computations is that of nested simulations. However, this method is also hardly realistic because of its huge computation resources demand. The least-squares Monte Carlo method has recently been suggested as a way to overcome these difficulties. The present paper confirms that using this method is indeed relevant for Solvency 2 computations at the level of a company. Read my new book on Probability Theory. All the key probability results in a compact and non-verbose form. Appropriate for preparing SOA Exam P and CAS Exam 1 and also for mastering the key probability concepts used in statistics, economics, finance or insurance. 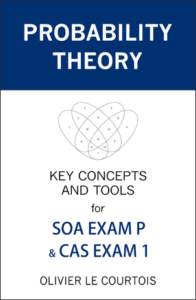 Some advice for SOA EXAM P ? WHICH CERTIFICATION IS BEST FOR YOU ? IN WHAT ORDER SHOULD YOU TAKE THE ASSOCIATESHIP EXAMS AND MODULES OF THE SOA ? Do you want to receive fresh information on my research and advice for the SOA exams?